LAS VEGAS — Terence Crawford listened to Jeff Horn and his team talk about everything from predicting a first-round knockout and how Horn would physically impose his will to complaints about the gloves being used and the legitimacy of Crawford’s hand injury that postponed the fight. 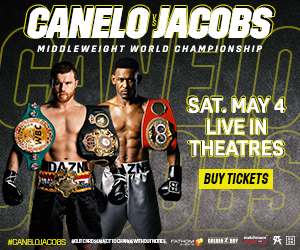 He heard everything little thing, and instead of talking trash in the media, he made the Australian pay for it in blood inside of the squared circle as the main event on ESPN’s streaming service, ESPN+. 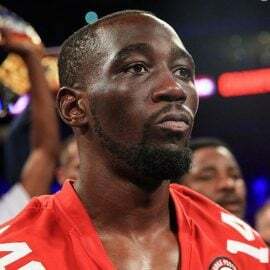 In front of 8,112 fans inside of the MGM Grand Garden Arena, Terence Crawford (33-0, 24 knockouts) dished out a severe beating to the one-dimensional Horn and eventually secured the stoppage in the 9th round to win the WBO welterweight title in his 147-pound debut. 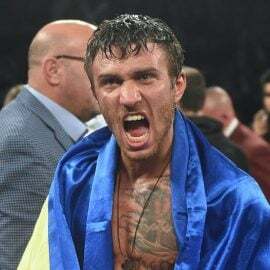 Horn (18-1-1), who won a controversial decision against Manny Pacquiao last year to become WBO champion, sought to impose his physicality on Crawford like he did Pacquiao. Crawford tried to tell him beforehand that he’s not Manny Pacquiao. But better than tell him, Crawford decided to show him. 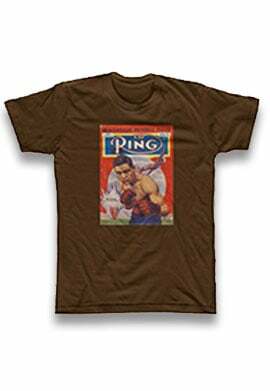 As expected, Horn tried to make it as physical as possible by rushing the Nebraskan and muscle him around the ring. But Crawford was ready for that and then some. 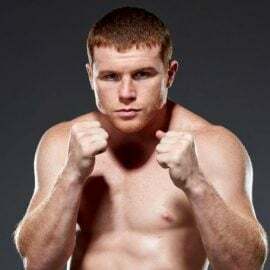 The former unified junior welterweight champion didn’t take long to time his opponent’s advances and in the first round he started prying the Aussie open with well-timed jabs and hard uppercuts. What some may have not expected was that Crawford also proved to be the stronger and more physical fighter. When he wasn’t planting hard counters on Horn, he was pushing him around the ring and making it a point to give him an extra shove whenever they were in a clinch. That didn’t divert Horn from his strategy of bulling forward, and as the fight progressed it just played into Crawford’s hands. 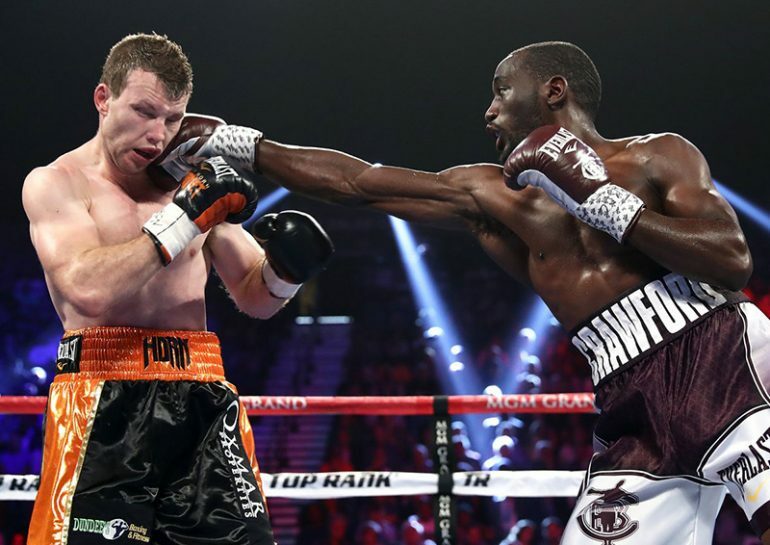 By the fifth round, Crawford was not only landing the harder and cleaner shots, he also decided to turn into the aggressor and stalk the slowly wilting Australian. To Horn’s credit — considering that he was a 10-1 underdog — he displayed a ton of heart and refused to fall apart even when his only strategy had no chance of succeeding. Crawford masterfully landed thunderous step-back check hooks whenever Horn put his head down and charged forward. Then, at the end of the fifth round, Crawford landed a thudding body shot that saw Horn wince in pain. Crawford saw it, too. A mischievous smile stretched across Bud’s face as the nasty streak that Crawford has been known for was in full effect. There was no chance that Crawford was going to allow this to go to the scorecards and spent the next two rounds tenderizing the meat before it was time to cook it in the eighth and eat it in the ninth. 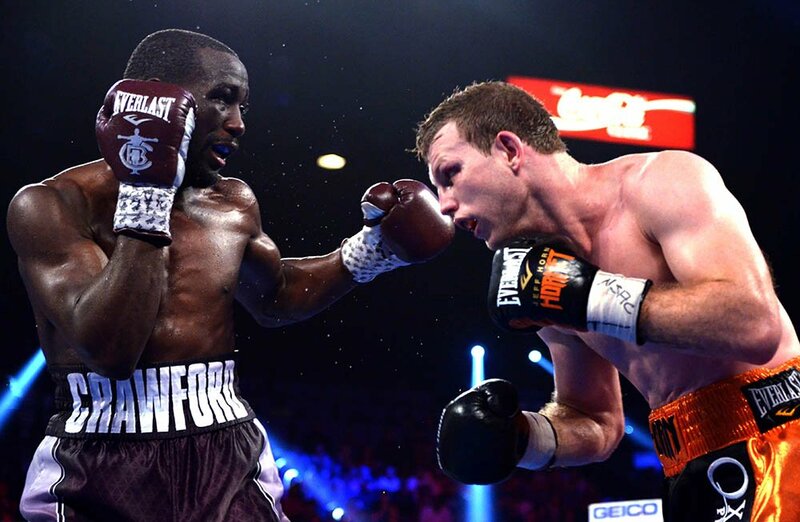 When Horn started to think twice about his advances, Crawford met him with a hard jab and a right hook. If Horn tried to close the distance, Crawford would shift his weight and sink a body shot that would take the wind out of the Aussie’s sails. Although Horn’s fans in the crowd sought to urge him on, Crawford simply used that energy of hope and turned it into more pain. In the eighth round, Crawford caught Horn ducking his head in preparation for the charge and lifted him with an uppercut followed by a pair of hard left hooks. Horn stepped back and appeared to be OK, but the look in his eyes said otherwise. Right at the end of the round, Crawford cut loose a straight right hand that nearly broke his opponent’s spirit. Fortunately Horn, it was at the bell. Unfortunately, Crawford was ready to eat his meal. 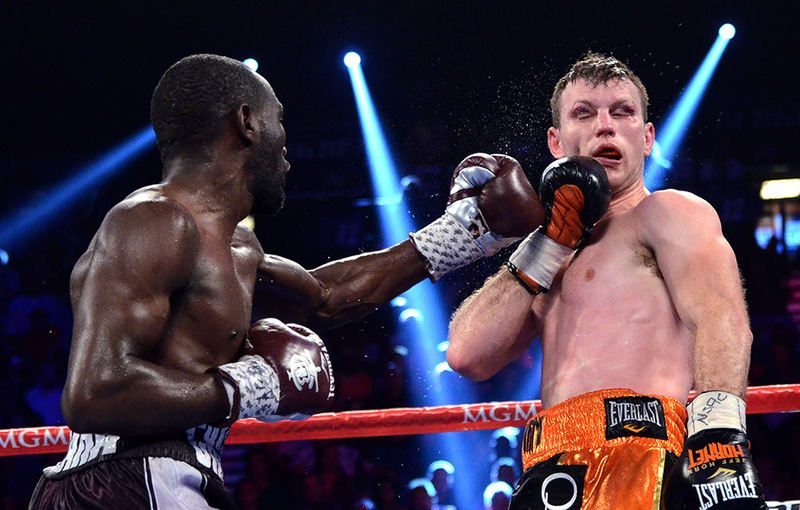 Crawford emptied the toolbox in the 9th round and systematically broke Horn down. As tough as Horn was, the punishment was becoming too much. 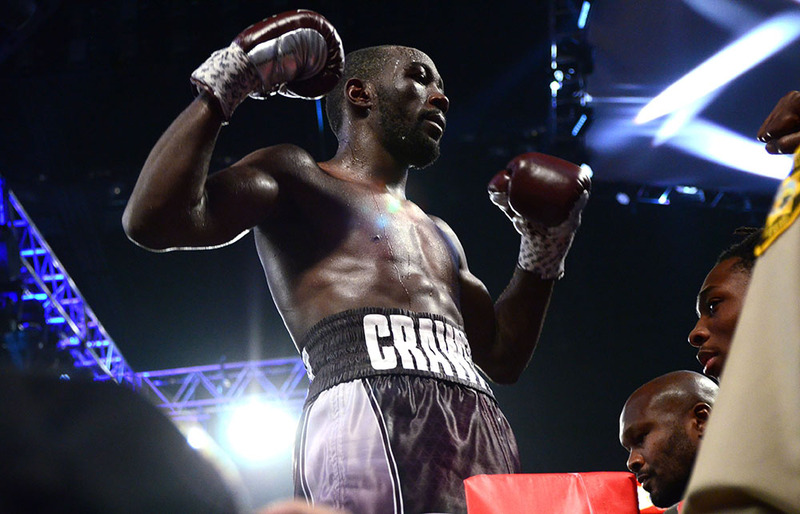 As one of the best finishers in the business, Crawford kept his cool and picked his shots. 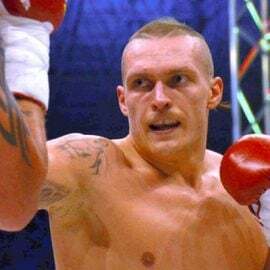 A crisp three-punch combination moved Horn back to the ropes and a left hook spun him to the canvas for the first knockdown of the fight. The end was near and Crawford had no interest letting his opponent survive. Completely outclassed and with no answers, Horn could only try to survive the assault, but Crawford launched a hellacious assortment of power shots. Each punch raised the excitement in the crowd as the end neared. Another violent salvo gave referee Robert Byrd no choice but to rescue Horn from further punishment. The end came at the 2:33 mark of the 9th round, but make no mistake: The end was never, ever in doubt. With the win, the 30-year-old begins a new quest to unify the titles in another weight class. 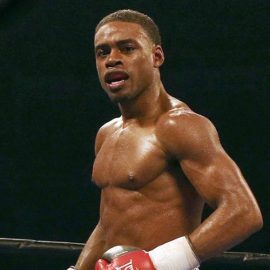 The challenge, however, will be in whether or not the politics between promoters will prevent Crawford to face the likes of Keith Thurman (WBA champion), Errol Spence (IBF champion) or the winner of the upcoming WBC title fight between Shawn Porter and Danny Garcia. Considering that Crawford is a huge risk for all four opponents, it’s unlikely that Al Haymon, Showtime and PBC will be looking to put any of those names against Crawford in the immediate future. 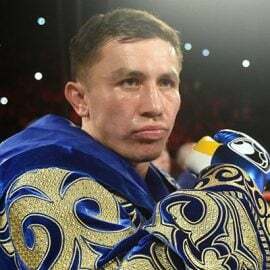 However, Crawford’s next fought could be against the hard hitting Jose Benavidez Jr., who scored a quick first-round knockout on the undercard and has been after a fight with Crawford for a few years. If nothing else, it would be a credible opponent for Crawford to face while he waits for the dust to settle over on Haymon’s side. Regardless, there’s no doubt that Crawford is one of the top three pound-for-pound fighters in the world, and performances such as this will only further cement his growing legend.